Bloom 'N Again Azaleas are unique in that they bloom in the spring and fall, and sometimes in summer. For azaleas, this is quite an amazing phenomenon. Bloom 'N Again Azaleas don't require pruning however can benefit from it. Read on to found out why. 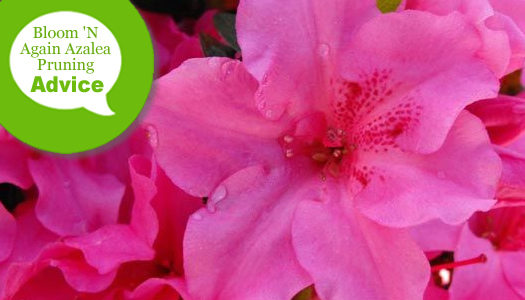 Unlike most other types of azaleas, which only set flower buds one time a year during fall, which then bloom in spring, Bloom 'N Again Azaleas produce buds in fall and throughout the growing season. Therefore, I recommend either no pruning at all or waiting to prune until immediately after the last bloom cycle of the season in early fall, but only if this occurs at least 45 days before the average first-frost date in your area. Reason being, pruning stimulates new growth that could be damaged by an early frost. So, to avoid problems, in the South (Zones 8-10) this means September. Further north (Zones 6 and 7) might mean August. Find your USDA Zone. At any time of year it's good practice to remove damaged or dead branches if and when they appear on your Bloom 'N Again Azaleas. This helps to keep the plant tidy and prevent the spread of disease. Cut back damaged branches just beyond the point of breakage and preferably just above a leaf on the branch. Cut back dead branches at their origin. When pruning a Bloom 'N Again Azalea immediately after its last bloom cycle, use a sharp pair of bypass hand pruners to cut back back branches that have outgrown the rest of the shrub and/or are spoiling the shape of the plant. Make your branch cuts at a point a couple inches or so above the main form of the plant. Try to make your cuts about an inch above a leaf on the branch. Note: I don't like using hedge trimmers to prune azaleas. Reason being, shearing foliage will cut their leaves in half, leaving your plants with an unsightly appearance. Rejuvenation pruning is a technique most often used to restore older, tired and thinned out azaleas to health. This pruning technique involves cutting the branches of the shrub back to short stumps. This is the only way to remove all of the old wood and provide the plant with one hundred percent juvenile wood loaded with leaf buds. When and if your azaleas require rejuvenation pruning, there are two basic methods for doing so. You can cut the overgrown shrub back in one fell swoop, or spread the pruning out over several seasons. If you choose the all-at-once approach, cut all the branches back to 6-12 inches above ground level in late winter or very early spring, before they would ordinarily flush out with new growth. When using this method, do not feed the azalea after pruning. After pruning, the shrub will typically grow a fair amount of new growth in the first year but may not start to produce blooms again until the second year. By the third or fourth year after the rejuvenation pruning the shrub should be of fair size and have a nice, compact shape. From this point on, you can prune it lightly as normal. The more gradual approach to rejuvenation pruning involves spreading the process over a three year period; cutting 1/3 of the stems to within 6-12 inches of the ground at the beginning of each growing season. By the end of this time, all the old wood will be removed and only healthy new growth will remain. When using this method, you can feed as normal after pruning.